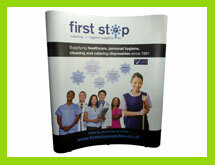 Curved pop up stands are still one of the most popular exhibition display stands sold in the UK. Consequently this type of exhibition stand can be seen at exhibitions, trade shows and events almost anywhere due to their ease of use and relatively low cost to create a large backdrop or marketing display stand. The complete pop up stand is designed to fit within a wheeled transport case as the graphics roll and take up very little space. 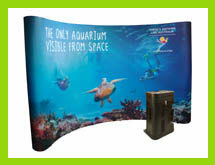 Therefore making these a favourite for companies that prefer a more portable solution for their exhibiting needs. To help you choose the correct size exhibition stand for your event and requirements. 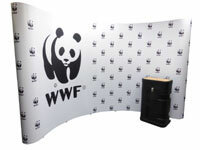 This guide gives information about our standard curved pop up stands and graphics. Furthermore this will help you decide which stand best suits your exhibiting needs going forward. Pop up stands are portable exhibition stands which can be easily transported and erected by just one person in minutes. Although quick to assemble they create a professional looking display stand within a tight budget. And with high quality printed graphics a pop up display will look amazing at your event. All of our exhibition pop up graphics are supplied with a ‘scuff resistant’ laminate to help protect them against general usage and are guaranteed not to fade. As a result of this exhibiting with one of our highly portable exhibition pop up stands couldn’t be easier. A wheeled transit case will hold the stands frame when folded down. It also safely stores the printed graphics panels and any other accessories that you may wish to purchase. We don’t just sell complete pop up stands and exhibition displays. In fact we also print and supply replacement pop up stand graphics to fit to your existing exhibition stands. Thus saving you money but more importantly will also be good for your green credentials by utilising your existing frame structure. If you have an exhibition stand which needs new printed graphics please do not hesitate to contact us. We print replacement graphics panels for most popular pop up stand frames and are happy to quote for graphics only. Still unsure about where to order your pop up stands ? Check out what our clients are saying about our work on our Google Plus reviews page. We not only supply complete exhibition stands but also print replacement graphics for most types of exhibition stand. Are you exhibiting for the first time and would like to know more about pop up stands ? See our ‘guide to pop up stands‘ for more information. A short video showing some of the many pop up stands that we sell here at RGL Displays. To find out more about the pop-up stands that we sell please visit our products page or click on one of the links below to take you to the stand size of your choice. 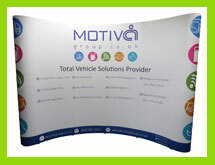 3×2 Pop Up Stands from £390+vat. 3×3 Pop Up Stands from £450+vat. 3×4 Pop Up Stands from £589+vat. 3×5 Pop Up Stands from £759+vat. “I urgently needed the graphics on my pop-up stand replaced and nothing could be too much trouble for Rob at RGL. Are pop up stands easy to assemble ? How big are pop up stands ? Can I buy new graphics for my pop up stand ? How much do Pop Up Stands cost ? Do you repair pop up frames ? Yes, pop up stands are designed to be transported and assembled by just one person without the need for any tools or equipment. Most of our pop up stands are about 2.3m tall, so a small set of steps can be useful when attaching the graphics but in most cases not necessary. Full instructions are included with each stand and furthermore all stands are assembled by us and tested before they leave our building. Therefore we can be sure all items are fully working and will not let you down at your event. Especially quick to build, in most cases a pop up stand can easily be assembled within 15 minutes. For this reason there is no need to allow for hours of build time at your exhibition. Notably this in turn will give you even more time to sell your products and services. Quick to pack away ! Likewise and more importantly for most people, pop up stands only take a matter of minutes to pack away. Hense making them a great choice of exhibition stand if you are on a tight time schedule. It is worth knowing that the terms 3×2, 3×3, 3×4 do not relate to the physical size of the stand. These figures actually refer to the number of frame structures width by height. We sell curved pop-up stands with a floor width ranging from 1.9m to 3.6m. Most of our stands have a footprint diagram which indicates the actual floor space required for your stand. If you would like to find out more about exhibition stand sizes please see our guide to the most popular pop up stands sold by clicking this link. As well as standard curved pop up stands you can also link stands together to form larger exhibition displays with the use of ghost panels (graphics which link one stand to another). If you are unsure of which pop up stand will fit best within your exhibition space please do not hesitate to contact us for help and advice. If you have a pop up stand in need of new printed graphics please let us know. We sell replacement graphics panels to fit most makes of exhibition stand. In order that we can quote you for new graphics please tell us the make and model of your stand. Once we have this information we will happily quote you for new graphics ready to attach to your existing frame. If you are not sure what make of stand it is that you have email us a photo and we’ll do our best to identify it. 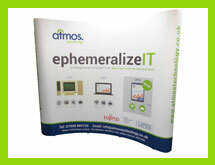 By replacing your pop up stand graphics to fit to your existing exhibition frame may save you money. But more importantly this will also help to keep you carbon footprint down, thus helping the environment. Advantage, Easy Pop Up Stands, Plex, Element pop ups, Evolution Quick, Evolution Xpress, Expand 2000, Impact pop-up displays, Nimlok and Supremacy to name a few. Pop up stands start from as little as £390+vat excluding delivery. Standard delivery is £25+vat to most parts of mainland UK for a single pop up stand supplied within a wheeled transit case. Occasionally we run special offers on items like our pop-up stands and also offer discounts for bulk orders. If you are looking to place an order with us simply drop us an email with your requirements and we will guide and assist you each step of the way. If you are considering ordering new pop up graphics for your existing stand but own a frame with broken or missing parts, we may be able to help. Especially since we often carry out repairs for our clients on their existing pop up frames without them having to pay a penny. We recently had a frame sent into us that was in very poor condition with both broken and bent scissor bars that needed new graphics. Before printing the graphics we contacted the manufacturer and arranged for a 24hr repair of the frame. Completely fixed with many new parts the frame came back to us next day in perfect condition.